We help employers and employees foster sustainable employment relationships. 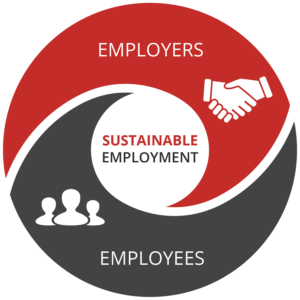 A sustainable employment relationship is a reciprocal arrangement between an employer and employee. It rests on a workplace that is transparent, collaborative and fair. And it fosters a culture of engagement, productivity, and commitment. By giving our clients the legal tools they need to build these relationships and teaching them how to use them. Read more about Sustainable Employment. We help employers create positive workplace change by adopting sustainable employment practices at every stage of the employment relationship. Learn how we can help by entering the Employer portal below. We educate employees about workers’ rights and the legal process generally and support them in achieving a sustainable workplace outcome. Learn how we can help by entering the Employee portal below.